Volunteering is a key part of The Fay School community values. “We accept families to Fay, not just students” is a consistent refrain during the application process and definitely comes to life upon acceptance. We’re looking for families that are interested and invested in raising children in partnership with our school to become well-rounded, intelligent, and kind people. I was drawn to this suggestion and have loved seeing the value in action. My daughter was admitted in the Primary II program for 3-year-olds and my son a few years later at the same age. Today they are in the Fourth Grade and First Grade, so I have had some great experiences and made some awesome memories as a member of the Fay School community. There are many reasons that I love volunteering at The Fay School, here are seven of them! That first look you get when they catch you walking through their classroom doors is the best! Mornings can be hectic, getting everyone dressed appropriately, tote bags packed with snacks plus homework, and, of course, navigating carpool lines. Evenings can be equally busy getting dinner made and eaten, homework complete, and bedtime room complete. Some weekdays seem to fly by. But when it’s volunteer time and I get on campus and spy my little one, they’re ecstatic to see me, get a huge grin and run to me for a great big hug. That moment is worth all of the schedule adjustments needed to be on campus. Another aspect of volunteering at school that I truly enjoy is being able to watch them interact with their friends, and over time getting to know more about their friends. When my kids were younger, some days it was hard to figure out what in the world they did at school. It’s as if, based on their recounting, they went to school and had lunch and came home. When I go to the classroom to volunteer, though, I enjoy watching them play with their friends and get to know how those relationships seen. These interactions give me some great leading questions to ask on the days they don’t have much to tell about the school day. Plus, over time, I get to know more about their friends. It’s fun to go on campus too and have one of their friends spot me first. The joyous scream of “Rory, Rory, your mom is here!” is almost as great as my child’s smile! I especially enjoy getting to the volunteering event a few minutes early or lingering when we’re done so I can glance around the room. We, of course, get all the writing and artwork home at some point, but it’s great to see it all on the wall next to the rest of the class. And to have my son or daughter point out their favorite spots in the room or recount when they worked on each project is a fun bonus. 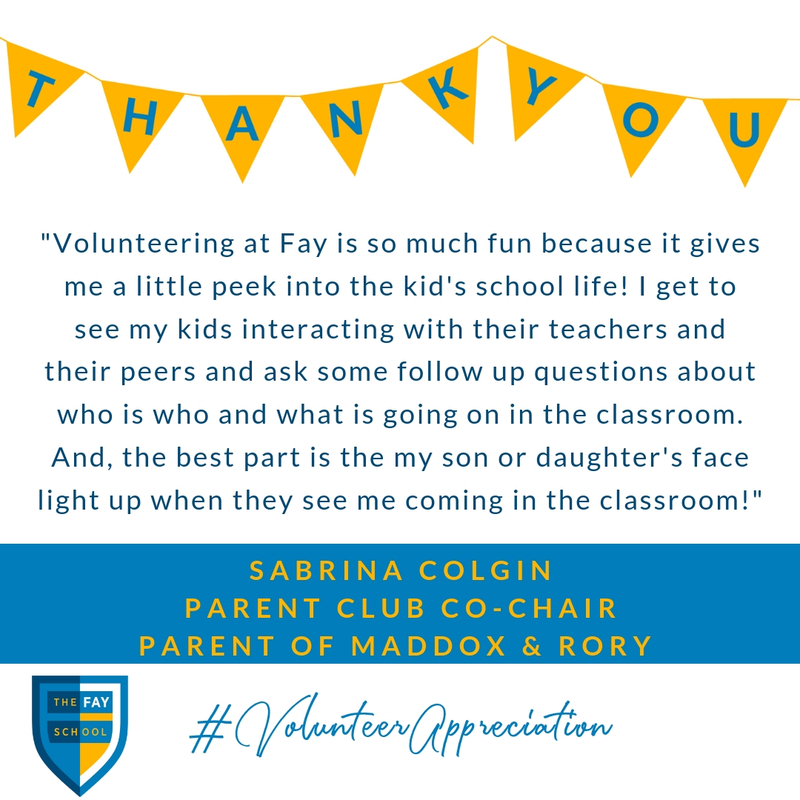 We have so many in-person volunteer opportunities at The Fay School that I can’t be there for every one of them based on my other commitments as well as I can’t be there for every one of them so that each parent has the opportunity to create these cool memories. Going back to our Fay value of accepting the family, I am always at such peace for the events I can’t make because I know my children’s classmates parents, my friends, will be there to help with the festive craft, get them dressed up perfectly for that year’s play, and take pictures so I can see everything I missed. Our Fay volunteers are helping all of the children they encounter, not just their own children. 6. Capturing this amazing moment in their life! Every year has such great age-appropriate volunteer opportunities. It’s been fun being apart of the range of them. Knowing that soon enough our kids will be in middle school, high school, and beyond with very little time for me to be at the school, in the classroom, and around their friends and teachers - I especially appreciate this time in their lives. It was fun with my older daughter to go through the different events and experience it all for the first time. The anticipation of knowing what’s coming, being excited about the events and then getting to do it again with my younger son has been awesome too. 7. So many ways to volunteer! Thankfully, The Fay School has so many ways to volunteer that I’m always able to feel involved according to what my schedule allows. Over the course of the nearly 7 years that we’ve been at Fay, I have worked at a small Houston-based energy business, been part of the sale of that business too, and an employee at a large multinational energy company, and, now, the owner of a day spa. Whether it’s the ebb and flow of the season or the craziness of a particular year, I have enjoyed volunteering in every capacity. In-person opportunities, whether for a class party, outdoor education, grade play or library period have a specialness to them because of the direct interactions with the little ones. Room parent has been a great way to get to know the parents in my kids class better as well as provide a helping hand to new parents to ensure they have all the info they need to make the most of their time at Fay. Making the teachers lives a bit easier has also been very rewarding considering how much they do for our children. Organizational volunteer opportunities have their own reward, knowing we are helping the school financially by helping with Annual Fund and Gala is great as we see it in action with improved technology and playground equipment for the kids. Many of these opportunities also provide more flexibility as they can potentially be handled outside of school hours or off campus, in some instances. Party planning help is also needed throughout the year, whether you love a theme like the Book Fair, Halloween Carnival, Gala, or end of school Fay Fair. Personally, I’m not an ultimate party planner but have enjoyed over the years smaller activities like helping put up the Book Fair decorations, man a booth to make bracelets for the Halloween Fair, or create a class basket for the silent auction at gala. Being a part of the Fay family and volunteering at our children’s school has been such a wonderful part of our elementary school years. I am so thankful for all of our other parents that have volunteered in every way we have possible, each opportunity means so much to the overall quality of school life for the kids. Cheers also to all of the faculty and staff who make the volunteer opportunities happen, welcome us on campus and into the classrooms at any time and ensure it’s a great experience for all. About Sabrina: Sabrina has been a Fay parent for 7 years. Her daughter, Rory, is currently in Fourth Grade and her son, Maddox, is currently in First Grade. Sabrina is the current Parents' Club Co-Chair and longtime volunteer at The Fay School! In addition to donations of her time, Sabrina's current business Sanctuary Spa is a school partner through Fay's Corporate Sponsorship Program.